I have purchased three Falk pans to date. Though my friends and family thought I was insane to spend so much on pans, I can honestly say that the quality of these pans makes a huge difference to the finished dish! Just don't get obsessed over keeping them shiny or you'll never use them - they look better with a burnish in my opinion anyway! 587 customers found this review helpful. Did you? Yes, I did! . . . . well almost. Excellent personal service from Falk in responding to queries. Good to know there is a company out there that employs real people! Could improve their website, though, by showing better photos, particularly of handles, etc, which, after all, are as important as the pans themselves. Falk also uses an excellent courier company which can actually tell you what time they will be delivering. British Gas, please note! 473 customers found this review helpful. Did you? Yes, I did! Bigos is what brings a tear to the eye of any Pole. In the UK it is known as "hunters stew" and the longer it bubbles and foams, the better it tastes. According to classical Polish literature it should bubble away for at least 24 hours, although some aficionados keep it going for a week or so. This 24 cm cauldron is ideal for Bigos as it keeps the foaming mass bubbling on a low heat for the required "yonks". In fact I had to use a heat dissipator as the lowest setting on the smallest ring on my cooker gave it Etna - esque properties. I just love this thing. Does a fab soup also. Basically, anything that needs to feed lots of people. You'll save a fortune on Gas. 594 customers found this review helpful. Did you? Yes, I did! This is a real monster of a pot; big, sturdy and deep! It’s great for making stock (lots of stock) and anything else where you need a good deep cauldron bubbling on the stovetop. It’s heavy, as one would expect, but the handles are very securely riveted to the side so moving it around safely is no worry. Another great piece from Falk. 758 customers found this review helpful. Did you? Yes, I did! I had been making stock in my 24cm casserole, but decided to splurge on this cauldron. It's a great depth and will be a great addition to our set of Falk cookware. Such a beautiful pot too! 662 customers found this review helpful. Did you? Yes, I did! And I thought my Le Cruiset pans were the bees knees! 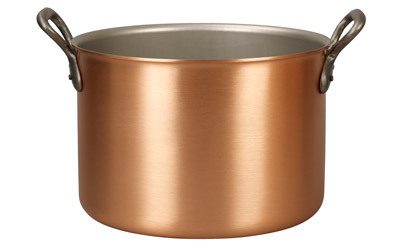 This pan is extremely well made, looks absolutely beautiful and it is so effective in distributing the heat evenly, you will never want to use any material other than copper. 584 customers found this review helpful. Did you? Yes, I did! A beautiful pan, perfect for cooking large volumes of liquid - stocks and stews are great, but it's versatile enough to cook a large volume of vegetables, when needed. Also looks beautiful. 576 customers found this review helpful. Did you? Yes, I did! Made biryani in this lovely piece. Great on the hob n better on the table. 710 customers found this review helpful. Did you? Yes, I did! This cauldron is a behemoth of a pot. Great for pastas, soups, stews or stocks. A solid performer. Update: I've had my Falk set for about a year now and cannot imagine cooking without them. The cauldron gets regular use and is one of my favorite pieces. I have found several uses already for this - stock pot, preparing pasta and making soup. I haven't used it in the oven, but anticipate cooking a stew in it shortly. Beautifully made. I am quite sure it will last my lifetime. 647 customers found this review helpful. Did you? Yes, I did!